Boy does my skin need so recovery assistance at the moment. It’s so confused by the weather and the central heating is playing havoc with my moisture levels. 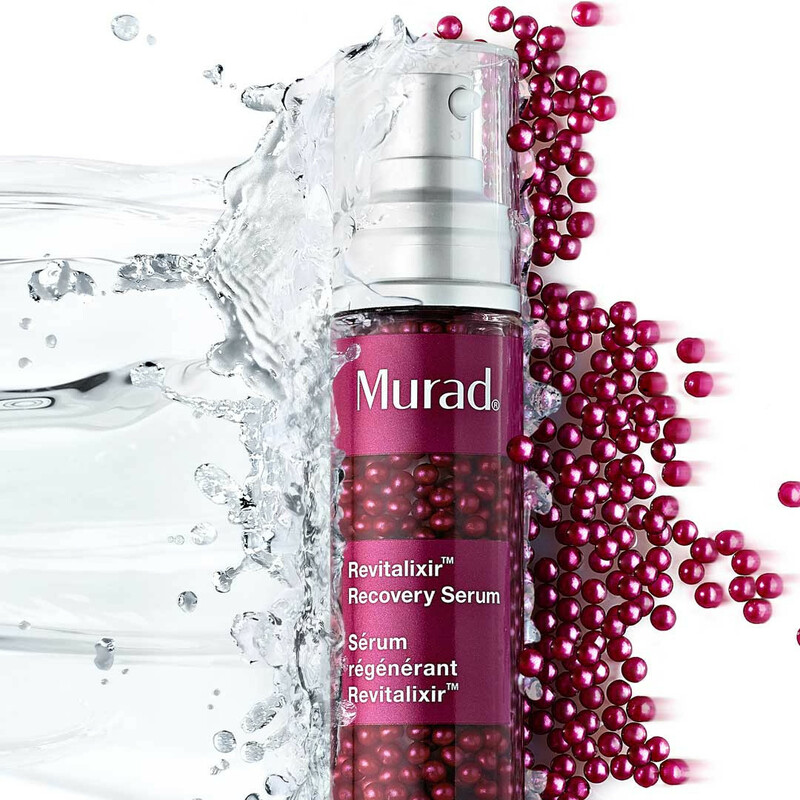 For the last 2 months I have been testing out the Revitalixir Recovery Serum from Murad. Great for those with dull skin texture, skin which has been exposed to environmental aggressors or for those who have been poorly and whose skin has suffered as a result. It contains oil-based spheres and a water based gel. By separating these ingredients, Murad has eliminated the use of binders within the product. This means the formula is more concentrated and the active ingredients can be delivered more effectively. It also contains Cannabis (Hemp seed oil), which is a source of Omega 3,6 and 9. These fatty acids help to smooth the skin, calm, increase hydration levels and are particularly great for dry or flaky skin types. This serum has a lightweight gel texture which massages away with an undetectable texture. It has a pearlescent tint to it, which softly illuminates the skin without looking shimmery. It gives a warming radiance to the skin. Immediate results from using this are increased luminosity. I didn’t particularly feel that my skin felt hydrated right after using but more refreshed and ready to accept the next stage of my skin care. Long-term my skin feels more supple and softened. Radiance in the form of brightness has increased and my skin generally feels calmer. The pump action 40ml tube will last you ages as a little goes a seriously long way. This serum is £70 so by no means a cheap option but if you are after a radiance inducing, skin calming serum that suits all skins (especially oily or combination skins) then it’s worth a look. This serum is available now here.